Space Shuttle astronaut Mike Massimino has penned a riveting article for Esquire magazine recounting his harrowing attempt to repair the Hubble Space Telescope back in 2009. His account is downright horrifying — the stuff of spacewalk nightmares. 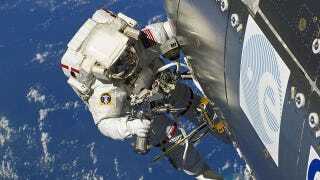 Back in May 2009, Massimino was chosen to perform a spacewalk during an Atlantis shuttle mission. And I realize that that handrail’s not coming off, which means I can’t get to the access panel with these 117 screws that I’ve been worrying about for five years, which means I can’t get to the power supply that failed, which means we’re not gonna be able to fix this instrument today, which means all these smart scientists can’t find life on other planets. And I’m to blame for this. I felt this deep loneliness. And it wasn’t just a Saturday-afternoon-with-a-book alone. I felt detached from the Earth. I felt that I was by myself, and everything that I knew and loved and that made me feel comfortable was far away. And then it started getting dark and cold. Because we travel 17,500 miles an hour, ninety minutes is one lap around the Earth. So it’s forty-five minutes of sunlight and forty-five minutes of darkness. And when you enter the darkness, it is not just darkness. It’s the darkest black I have ever experienced. It’s the complete absence of light. It gets cold, and I could feel that coldness, and I could sense the darkness coming. And it just added to my loneliness. Read the rest of Massimino's account and find out what he did next.